Today I’m preparing for our Depot Open Weekend at Acton, taking place this Saturday and Sunday. We’ll be exploring lots of engineering things over the weekend, so I’ve been hunting out posters which fit in with the theme. There were also 14 ‘ordinary accidents’. What do you think this might have included? The poster below is by the same artist, warning of the dangers of slippery oil and grease. I really like the red warning triangles and the bold designs which must have made them stand out on the garage walls. What do you think of them? You can see more from the series by searching for Edward E Hunt on our poster browser. And here are a few more comments from people about the posters above. 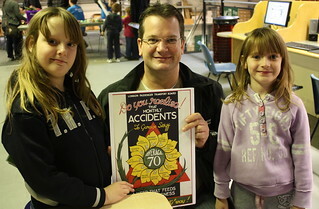 Laraine thought the poster about the average monthly accidents was ‘very good’, and Ming liked this one because ‘it is very visible.’ The flower was a firm favourite with lots of people, who, like David, said ‘it just jumps out at you!.’ Mr Grainger enjoyed the ‘eye catching detail and colours’, and noticed that yellow is a ‘warning colour.’ Kiki and her mum said they liked it ‘because it is colourful and has a flower on it.’ We had some great flower drawings from younger visitors. People were surprised to see that there were posters like these up in garages. As one visitor said ‘It’s good to see “Health and Safety” isn’t new!